June 17 morning, Rajesh Laxman Pille was a tad nervous. The monsoon had arrived in Mumbai. Just a day ago Rajesh, like all soccer-crazy kids in Mumbai, had played a match of soccer with his friends, knowing that life after June 17 may not be the same again. Like thousands of students who had written their school-leaving exams in Mumbai, Rajesh too was awaiting his results. At around 3 pm, one of the teachers at SUPPORT (Society Undertaking Poor People’s Onus For Rehabilitation), a non-governmental organisation that rehabilitates Mumbai street children, told him he had secured 71.82 percent. Rajesh, who has no hands, had written all his papers algebra, geometry, science and technology, English, Hindi, Marathi, history and geography by holding pen, pencil, and the geometric compass by the toes of his left leg. That he plays soccer (his favorite is Portugal’s Cristiano Ronaldo, who he desperately wants to meet), carom and chess, though incidental, is amazing too. Overnight, Rajesh went from oblivion to limelight. I was very scared of my results. Though I had studied sincerely I expected about 60 percent,” says Rajesh, 18, who only joined school when he was 7, in fluent Marathi. Though he speaks good Hindi he is in a spot of bother when somebody uses a difficult word. When you ask him about his mother tongue, Rajesh is not too forthcoming. While his last name ‘Pille’ suggests he is from south India, his fluent Marathi makes you think otherwise. 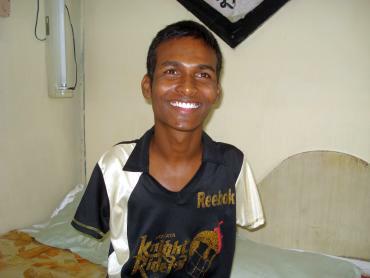 Rajesh doesn’t remember his age when he was crippled. “I was running after a kite. I accidentally touched a live electric wire with both my hands. That was it,” he says with a shrug of his shoulders. Though he lived with his parents when tragedy struck, he doesn’t say how he ended up on Mumbai’s streets, addicted to cigarettes, for which he begged at the city’s famed Chhatrapati Shivaji Terminus, home to scores of abandoned street children. But then Rajesh, who was born July 26, 1992, remembers what he describes as his rebirth, which happened sometime in 1999. He eagerly narrates that story. Sujata Ganega, one of the founder trustees of SUPPORT, who Rajesh today fondly calls ‘mummy’, saw the limbless 7-year-old smoking a cigarette, holding it in his leg. She immediately wondered: If this boy can smoke with his leg, he can surely write using the same technique. After completing the legal formalities and ascertaining that Rajesh was an orphan, abandoned on the streets, she brought him to SUPPORT’s office in Vakola, Santacruz, north-western Mumbai, where 180 street kids get detoxified, educated, de-addicted and then rehabilitated. “There was nobody on the streets who helped me to get over my smoking addiction. But here the volunteers and Mummy gave me affection, warmth and confidence to abandon my bad habits and achieve what I have done today,” says Rajesh. “For the first few days at SUPPORT I would just throw tantrums, refuse to eat food, and abuse the volunteers with expletives [he knew plenty of them]. The pangs of tobacco addiction was just too difficult to ignore,” he says. It took almost three weeks of detoxification, counseling, medicines and persuasion about the fruits of good life that helped Rajesh wean himself away from his addiction. The next challenge was to learn to write using his leg. It took almost three years of dogged perseverance before Rajesh could write legibly. The real fun, he says, was learning to draw geometrical sketches using a compass. One day, when he was in Class 6, Rajesh saw Sandeep Kashyap, a teacher at SUPPORT, use a compass to draw geometrical figures for his pupils. That set the ball rolling. In the beginning I’d hurt my legs because of the pointed needle. After practicing for two days, for more than seven hours, I managed to draw a smooth circle. My confidence soared,” he recalls. Rajesh would need a lot of this confidence when students ridiculed him about his handicap and taunted him for being favored for his disability. All those bad memories are part of Rajesh’s past. The present is he has scored 72 percent marks in his school-leaving exams and has dreams for a bright future. He plans to become a psychologist some day. “When I was a kid I wanted to become a ‘scientist’,” he says. “Actually I wanted to become a psychologist but thought that those who read and analysed people’s behavior were called scientists. Mummy and other volunteers here helped me understand the difference between a ‘scientist’ and a psychologist,” he says with a grin. He is confident that his disability will not impede his future. He always sees two scenarios. One where he is handicapped and the competition easily excels over him because of his disability. The other where he sees himself as handicapped but winning over the competition through his grit and gumption. It is a very inspiring story worth learning a lot in life. Mind set determines success in life. WHEN THE GOING GETS TOUGH, TOUGH GET GOING. Similar to Hellen Keller sory. I salute SUPPORT and this boy for his grit and positiveness and also wish the very best. May God bless him. IT IS WONDERFUL MOTOVATION TO STUDENTS.THIS KIND OF EXAMPLES TO BE INFORMED TO THE STUDENTS, THEN ONLY THEY KNOW HOW THEY ARE LIVING WITH LOT OF FACILITIES.